Few technological innovations have done more to spur economic growth, grow infrastructure, and improve the American way of life than the invention of the automobile, which also sparked the rise of many secondary industries. 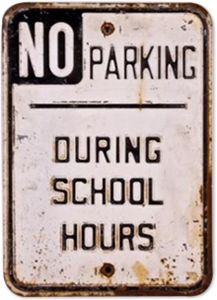 One such secondary industry which evolved alongside the traffic and road systems in the 20th century was Parking Sign Manufacturing. 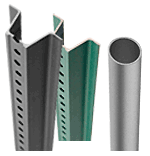 Parking Signs started as incredibly simple products, and some today are still very simple, but over time, parking signs have become increasingly intricate and specific. See our Parking Sign Timeline. As our lives have become more complex, fraught with more and more new laws and regulations, our parking signs have also become more complex, in accordance with these same laws and regulations. The mass-production of automobiles in the United States began at the turn of the 20th century, and so too did sign production. Federal Highway Administration (FHWA) records indicate that in 1905, the Buffalo Automobile Club installed one of the first known widespread signpost networks in the state of New York. The Automobile Club of California followed suit just a few years later, posting signs on the main highways within a 250 mile radius of San Francisco. 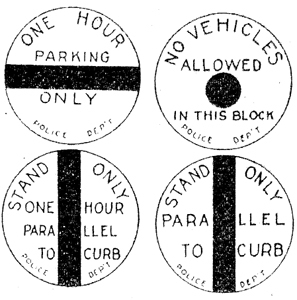 Early parking signs were often sponsored by Automobile Clubs. This sign, from the author’s collection was likely printed and funded by the AAA. Although founded in 1914, the American Association of State Highway Officials (AASHO) and not begin to discuss the nation-wide implementation of Parking Signs until the 1927 manual. Also in the 1920’s, the Traffic Committee of the International Police Conference proposed the designs pictured below. A parking sign designed suggested by the Traffic Committee of the International Police Conference. 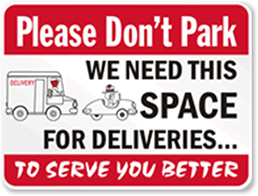 Another parking sign designed suggested by the Traffic Committee of the International Police Conference. As you can see, these signs were incredibly simple in their message, but their shapes were unnecessarily complicated and not easy to mass manufacture; as a result, these inefficient early designs were phased out rather quickly by stronger market forces. Typical of how different regions designed their own signs, the circular engraved signs above were specified by San Diego in the early 1920’s. Here, the designer used a solid color bar to indicate if parallel “standing” is permissable. The standard specifies red as the print color for no parking signs. This is the start of the Parking Sign color coding. 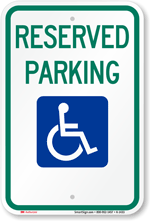 Here, The specified color for this reserved parking sign is green. As evidenced by the signs above, the first half of the 20th century was an era of simplicity for parking sign producers. 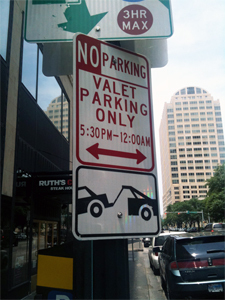 Few businesses needed to customize parking signs for their specific needs, and for many regions, there were not enough cars on the road to justify even making parking signs. 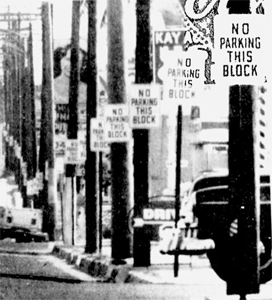 For larger cities, Lyle Culvert & Road Equipment Company manufactured circular No Parking Signs aimed primarily at tourists who were unfamiliar with local parking regulations. This advertisement in the May, 1925 issue of The Lyle Sign Post newspaper illustrates some of the different products offered by Lyle Signs. An advertisement for Lyle Culvert & Road Equipment Co parking signs from 1925. This system cost $7.85. 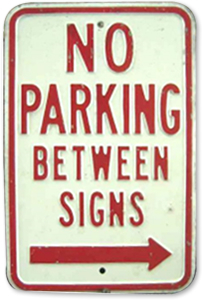 In many ways, the first parking signs laid the groundwork for today’s sign industry. 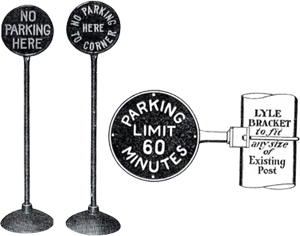 This Two Hour Parking sign from the 1930’s, pictured on the left below, should look surprisingly similar the ones that exist today—it’s even 12 inches by 18 inches, the standard size for many of today’s parking signs. As highway systems expanded and car-ownership became more common, businesses and professional offices began to require parking signs for their private lots. The round metal No Parking Loading Zone for Patients Sign pictured below on the right, also from the 1930’s, is one example of this expansion in demand; presumably, this one was for a doctor’s office. 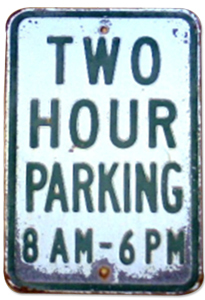 A two hour parking sign from the 1930s. 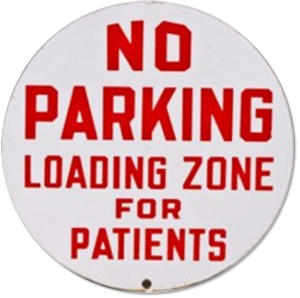 A No Parking Loading Zone for Patients Sign that graced doctor’s offices in the 1930s. New technologies also facilitated the production of detailed, three dimensional, embossed signs. 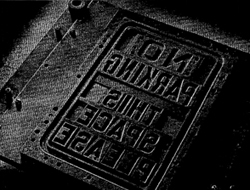 Lyle Signs, Inc, bought its first embossing press in 1933, and the pressing process used to emboss metal signs has remained basically the same. 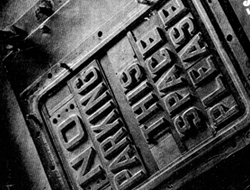 Below is a picture of an early embossing press and two embossed parking signs. Many of these embossed signs can still be found even today. 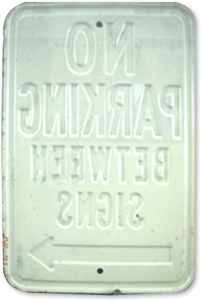 The back side of a porcelain no parking sign. As car ownership rates rose and the automobile became increasingly affordable and accessible for the American consumer, parking signs and parking sign messages became more diverse. The American consumer population was also becoming more ethnically diverse, as African Americans sought to climb the socio-economic ladder and defeat institutional forces of bigotry like the Jim Crow Laws. In the South and in other regions across the country, racist signs with messages like “Whites Only” were erected in bathrooms, restaurants, and other public businesses as a means of repressing the black race. Parking signs are a naturally restrictive invention—they dictate who can park where for how long—yet there is little evidence of any overtly racist parking signs. It is surprising that such exclusionary signs were never put to use by bigoted town sheriffs or powerful segregationists in state governments, but perhaps they were simply never needed. There were plenty of “unwritten” racist rules that African Americans were expected to observe, and in the south, many used public transportation and had no reason to own cars. The Parking sign industry seems to have kept its hands clean of the racist legacy that has permanently tainted American history. However, plenty of other social forces would come to influence sign manufacturing. 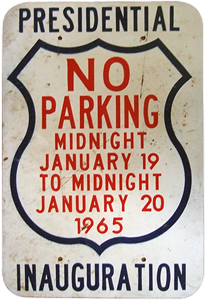 The rise of the American civil rights movement in middle of the century coincided with the introduction of new parking sign materials and artwork: newer, durable materials like aluminum were used to create longer-lasting signs, while designs were streamlined to send clear messages, consistent across different states. Most of the first signs were made of porcelain and/or steel, but in the 1960’s aluminum became the metal of choice for sign manufacturers, and it has remained so to this day. One popular design innovation—highlighting “NO” in the top left corner—can be observed below. This detail is still common in many of today’s signs. No Parking signs on a block in Florida. Regulations did not yet define the frequency of No Parking Signs. Parking signs also became increasingly specialized and specific. The sign below (left) was placed on the streets which would serve as the site of the 1969 Presidential Inaugural Parade for Richard Nixon, who was replacing Lyndon B. Johnson in the White House. In Toledo, No Parking Signs were created to keep the streets clear during “Leaf Pickup days” (pictured middle below). 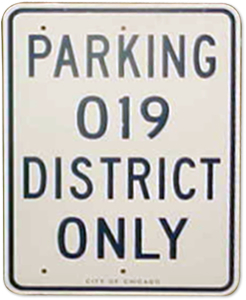 In Chicago (and many other cities), Police Parking Signs like the one pictured below (right) were erected in districts all over the city so as to ensure that parking spaces were reserved for the officers of particular districts. If you look closely, you can see a signature that reads “City of Chicago” that runs along the edge of the sign next to a blue border. Most signs from this period were made in city or county owned sign shops. 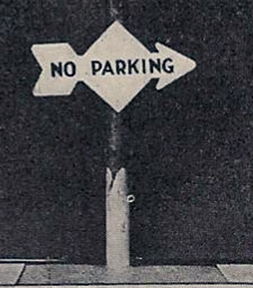 A No Parking Sign from that lined the streets of DC before the Presidential Inauguration of 1969. 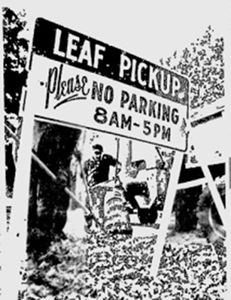 A Leaf Pickup No Parking Sign from Toledo, Ohio. A Police Parking Sign from Chicago. Parking signs increasingly become the public face of civic legislation (here defining when the streets need to be clear of cars for night street cleaning). 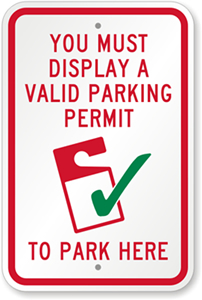 Private parking signs co-opt the look of the Federal Parking Sign standards. 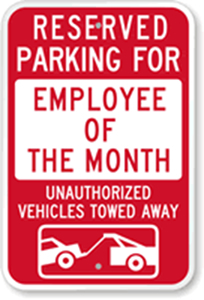 An employee of the month parking sign from myparkingsign.com. 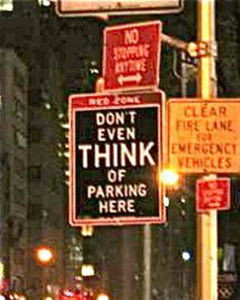 There’s even a market for goofy and witty parking signs, such as the ones below. 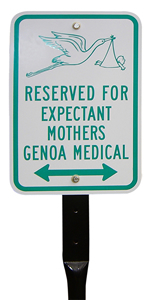 A funny sign reserving a parking spot for expectant mothers that includes a picture of the stork carrying a baby. Parking signs have become, literally, symbolic representations of a new, complicated world overrun with rules and regulations. So how do we keep signs user-friendly, easy to understand and obey amidst all this complexity? Standardized color schemes nicely codify the different types of parking signs— red for prohibition, green for permission, and blue for informational. 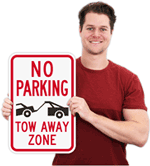 Clear fonts increase the legibility of signs, and symbols like the car-tow graphic on the sign below ensure that even drivers who can’t read will understand the ramifications of parking illegally. For communities with large non-English speaking populations, there are even bilingual parking signs, like this No Parking Sign featuring the same message written in Spanish and English. This is evidence of how social forces like immigration can greatly influence the growth of the parking sign industry. 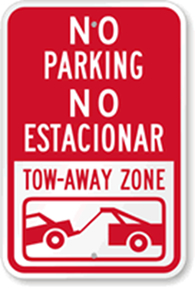 A bilingual no parking sign wards off violators in Spanish and English. 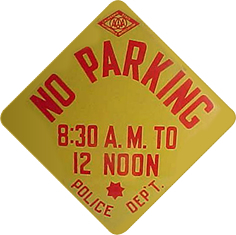 This retro no parking sign is available at myparkingsign.com.